Oceanfront 1 story. 'Beachfront Hideaway' - treed setting, ocean in the back yd! Pacific Beach home on the beach, less than a mile south of Seabrook. Large home right on the ocean in a private setting, beachfront in your back yard. Reservations confirmed and home readied personally by owner. The Beachfront Hideaway is a large one-level oceanfront home - a tastefully appointed vacation getaway with plenty of space. This home offers relaxed living, all on one level with 5 bedrooms and 3 baths. There are oriental wool carpets underfoot throughout the house, providing warmth, comfort, and adding to the quiet atmosphere. Having plenty of comfortable seating is important to me, and the large living room offers large sectionals with down cushions. Sit back and enjoy the view of the ocean, relaxing with your friends / family. The five bedrooms plus den offer four queen beds and four twin beds. Please go to 'Amenities' tab from upper menu bar for more information about bedrooms, and for even further detail, click on 'View more photos and information' at the bottom of page, above Notes. The large kitchen is fully equipped and the dining table enjoys excellent ocean views and seats 12. The living room offers plenty of comfortable seating with three sectionals and beautifulm views of the waves. Throughout the home, wood, bamboo, and stone are creatively used to provide warmth and beauty uniquely in each room. Several rooms have bamboo or mahogany ceilings, or bead-board walls inset with a surprise of marble or granite. Hi! I am Alea, the owner of the Beachfront Hideaway..... I care for this home, maintain it, clean it, and absolutely love it! I am greatly blessed by the fact that families and friends make memories at my home, enjoying each other, and enjoying the amazing ocean. Please call me and chat with me about my home anytime, or send me an email with any questions that you have. The home is furnished with bits and pieces of my life thus far, including the artwork, accessories, furnishings, etc. It has been lovingly remodeled over several years, my intention being to provide comfortable spaces throughout the home, in order to accommodate up to 12 people in an environment of delight and charm - just in case the magnificence of the ocean and the joy of those around you isn't enough! There is a story behind almost every detail in the house, such as the bead board lining the living room walls - which came from a theater set downtown Seattle - complete with the white wash that is perfectly "beachy"! And the inset slab of marble on the west wall of the side bedroom - designating the place where I found framing from what used to be a view window (in a wall that was now in the middle of the house!). I could just imagine the house whispering that once upon a time it was only a fishing cabin. I come from Tacoma to clean and ready the home, and most of the time I meet guests upon their arrival. Please feel free to ask about any of the details, and I'll fill you in on the story! PS - My hope is to have my own family someday, and make lots of fun memories - here at the beach! It's quite an amazing story - I never looked at any other home on the coast but this one. I was in the car, headed north on Hwy 109, having never been in this part of the world ever before. I was amazed at the beauty! The tall trees, the gleaming ocean, the peacefulness of it all. I definitely felt that I was in an area 'less traveled', and it was gorgeous! At the time, I owned a couple homes that I rented out to travelers in the Seattle area, and all at once I looked out of the window over toward the ocean, and looked out over an A-frame cabin. Right at that moment, I thought "I'd love to have a vacation home here!". Less than a year later, the Lord provided me the amazing opportunity to buy this home - located 3 doors down from where I'd had that thought! All of it was a series of miracles that were completely unlikely to happen. Over the next few years, the miracle of keeping the beach house continued, as all else that I had fell away. And as my whole life got 'remodeled', somehow the once dark and dreary (and rather homely!) beach house got remodeled at the same time! I discovered what a wonderful oasis the beach was in the midst of the whirlwind of everyday life. As I got close to the beach in my car, my cell service dropped off, my cares all the sudden seemed back in the city, and even going out to move lumber around, paint, fix things, etc., seemed like a joy because of the peace all around me. This property is one of the big blessings of my life - I hope it profoundly blesses those that enjoy it. Fond memories are such a delight - both to make, and to treasure. The wealth of memories made at the Beachfront Hideaway, overwhelms and amazes me sometimes. The guestbook is full of notes and remembrances of the special times that families and friends share and create at my home. That is the best thing about my home! Please email me from the designated spot to the right, or call me anytime if you have questions about my home or the surrounding area. I am available during your stay if questions arise - or if you're wondering where to buy some cheap sunglasses! The ocean always has a different personality. I hope that each person that spends time at my home, will take some time to just watch it and experience the calming that seems to come with watching the waves, and forgetting about all else. Walk out into the yard at night, hear the roar of the waves, and then look up, and gaze at the sky sparkling with stars. Oh, and there's nothing more lovely than the moonlight streaming across the water..... It's such a beautiful part of this world! The Beachfront Hideaway is a home built with love, maintained with care, right in the middle of a lovely piece of the coast, with cozy spaces for you and your loved ones. Although you may only be able to fit a certain number of shells and really cool rocks in your travel bag to take home, there is no limit to the number of wonderful memories you can take back and keep forever! The master bath offers both a walk-in shower and a soaking tub, with views of the ocean available from the tub. The central bath also has an elegant feel with wainscoted walls inset with granite, a pedestal sink with gold hardware, and hand-blown glass light shades providing illumination. The third bath has a tiled floor, wainscoted walls, and soft lighting. This bath offers a corner shower and is located off the second master. As you stroll out on the lawn, you can see the beach spreading out in both directions. Many times of the year, you have the opportunity to feel as if you are the only one on the beach! The backyard of my home borders the sandy beach. There is a protective strip of beach-grass between my lawn and the sand, and I keep it mowed down with my electric mower. The main living areas offer a wonderful view of the ocean, as does the master bedroom. The presence of the ocean is ever prominent as you enjoy this home. My home is one of only a few that are low-bank ocean front. My property is wide and bordered by trees on both sides, providing an enclave that opens up to the wide beach and tremendous waves! Whether the waves are high, or the water is calm, you will enjoy the beauty of the broad ocean. My home is direct waterfront, with the beach located straight out the back door to the water. The living room, dining room, and kitchen are at the center of the house, all enjoying views of the beach and surf. The large dining table is located right in front of a large picture window looking out to the ocean beyond. This is a great gathering spot for meals, games, and conversation. There is a very large video library, and all the bedrooms and the living room offer televisions with movie players. Please Note: The occupancy maximum of 12 people is strictly enforced. Non-adherence will result in the necessity to immediately vacate the property without refund. **** **** If a guest permits more than 12 people to visit or stay at the property, the well-being of the home, property, and systems are all put at risk. And as a result, the vacations of subsequent guests are all put in jeopardy. - Please plan accordingly. **** **** Occupancy: The maximum occupancy is 12 people. This includes those staying at the home, or anyone additionally invited to the home by a guest, regardless of their duration of time at the property. This home's systems cannot accommodate any in excess of 12 people. **** **** No parties: This home may not be used as a site for an event, function, or party. Owner reserves the right to refuse service and / or request vacating of the premises immediately and without refund if found that this home is / will be / has been used in any of these ways by guests. Amazing home! It had everything we were looking for, and more! Would stay again! I booked this stay for a weekend away for my bookclub ladies. I was unable to attend but my friends enjoyed their stay. Some of their comments: "Cozy, cute and comfy", "Loved the easy beach access and fire area", "Well stocked kitchen". Thank you Alea! It was exactly as described! Beautiful location nice tasteful eclectic decor with pleanty of room! We enjoyed our stay emensly! We loved everything about the house and property.! Perfect house for our girlfriend's weekend!! Eleven of us stayed very comfortably!!! This house is right on the beach!! No soggy grass to walk through! Four words;” Wildly Better Than Expected”. That is the phrase that best describes this lovely home! And, the attention to detail, the kindness and welcoming attitude shown by the owner were just cream on top! This is a fabulous place, no really! Spotless clean; easy to get into; well stocked with everything from dishes and plates to towels, books, movies, and bedding. The location? OH MY GOSH! 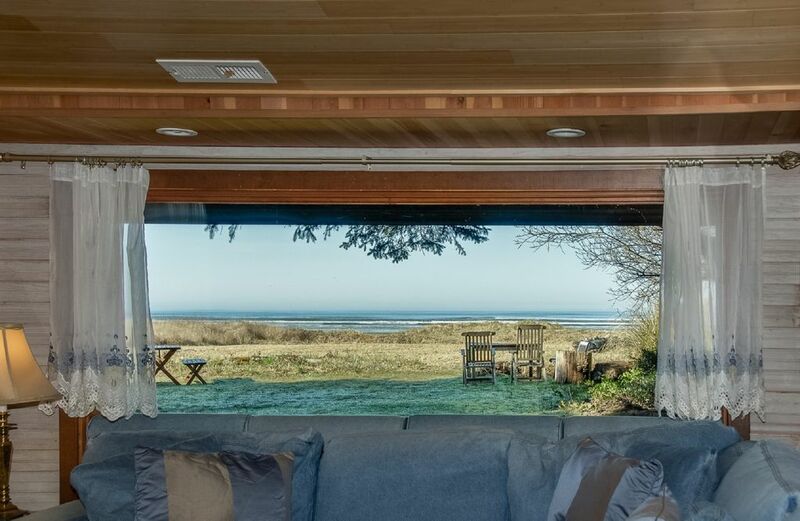 “Oh, hello ocean!” It is also close enough to places like Ocean Shores and the grooviest little market to make it seem convenient…but still help you to feel you are happily in your own chunk of paradise, how cool is that? Love, love, love the whimsical, luxurious, art-filled rooms! There were these gorgeous, vintage chandeliers, cool French doors, and all of these luxurious Persian rugs? Oh my! Did I mention it was so clean and inviting? Well, it is worth repeating! No funky odors, not musty-ish scents…YAY! That kitchen is perfect! Note to self; when you pack, you don’t need that, skip packing those…it is all there (and that is a lot, coming from me)! Moving on to the main living area…I so loved the way they created these perfectly situated, super-comfortable seating areas just welcoming you in! Baskets of books! There were baskets of books! And more movies than you could ever possibly watch! I can absolutely see a happy family reunion, bridal shower weekend, retreat, girls’ weekend, or just a “let’s get the heck out of Dodge” vacation. Can you tell? I am loving this place! OH! And, there are fire pits and outdoor furniture! It is January, so they weren’t used, but THEY WERE THERE! And, no. I do not have any affiliation with the owner (other than my untold, new-found admiration). I just adore being able to say, “YAY ME, I PICKED THE PERFECT PLACE!” and, I did. This “cottage” is amazing. Now, remember, that does not even take into account the mesmerizing ocean view. Seriously. WOW! Alea, thank you, so much for offering this place. Can’t wait to return! This beautiful home is located in a picturesque coastal area with tall windswept trees atop and alongside the rugged shoreline. Colorful sandstone banks are laced with wide soft sand beaches. The area has a small town feel with local shops and eateries. Peace and natural beauty abounds. · Longer minimums for holidays · Holidays are priced as a weekend night. · 5 Night minimum in summer season · During the summer season, if a 6 or 7 night opening develops between other bookings, a matching minimum night stay may apply to that period · Holidays = wknd rate. · Please Note: The occupancy maximum of 12 people is strictly enforced. Non-adherence will result in the necessity to immediately vacate the property without refund. If a guest permits more than 12 people to visit or stay at the property, the well-being of the home, property, and systems are all put at risk. And as a result, the vacations of subsequent guests are all put in jeopardy. Please plan accordingly. · Occupancy: This home and its grounds can accommodate 12 people maximum. This includes those staying at the home, or anyone additionally invited to the home by a guest, regardless of their duration of time at the house, and regardless of whether they sleep at the home. This home's systems cannot accommodate any in excess of 12 people. Non-adherence is cause for request that all guests / people vacate immediately, with no refund. Owner shall have the right to charge the credit card used for reservation and / or pursue legal remedy for physical damage to home, furnishings, systems, or grounds, caused by excess people at the home or property. · No smoking, no pets: This home is non-smoking and no pets. Non-adherence is cause for request that everyone in the group immediately vacate with no refund. Owner shall have the right to charge the credit card used for reservation and/or pursue legal remedy for physical damage to home, furnishings, or grounds.